How would history be different if Anne Boleyn had given Henry VIII a healthy son to succeed him on the English throne? Or would it just be repeating itself? That’s the question Andersen explores in her The Boleyn Trilogy. The Boleyn Deceit is the second book. You don’t need to read the first one to be able to follow and understand the story, although, you’ll probably want to once you’ve finished this. I know I did, and these what-ifs novels aren’t usually my cup of tea. I’m one of those annoying people who likes their historical fiction novels to be as accurate as possible, yet I wasn’t able to put this book down. I think part of the reason is that the events in this book, although obviously fictional, are plausible. Plus, Andersen is a very skilled storyteller who managed to bring the Tudor court and its people to life. Following the regency period, Henry IX, better known as William, has just become king in his own right. But his throne is far from secure. Plots are being hatched and executed all around him and it’s difficult to tell who’s innocent and who’s guilty. William can only trust three people: his sister Elizabeth, his best friend Dominic, and Minette, an orphan brought up as a royal ward with whom he’s in love. But Minette is in love with Dominic, who reciprocates her feelings. Of course, William ignores all this. 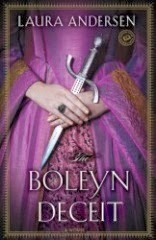 The Boleyn Deceit is a story of love, drama, intrigue and betrayal. A page-turner, the fast-paced plot is full of twists and turns, while the characters are well-developed. The book is also well-researched, but the historical details are weaved into the story in a way that adds authenticity to it. It’s a highly entertaining and enjoyable read, and one I recommend to all fans of historical fiction. Following the success of “Lady Almina and the Real Downton Abbey: The Lost Legacy of Highclere Castle”, the Countess of Carnarvon has penned another book about another resident of the magnificent residence where Downtown Abbey is filmed: Lady Catherine. Catherine Wendell was a charming American girl who, after her father’s death, moved with her family to England, where she met Porchey, the future 6th Earl of Carnarvon. The two fall in love, get married and have two children. But soon problems arise and, eventually, Porchey’s affairs put an end to the marriage. Catherine and Porchey lived in a time that was exciting but also tragic. We get a glimpse of what life was like in the Roaring ’20s and ’30s, and find out how they managed to survive World War II. Catherine remained in London, which was heavily bombarded, while Porchey stayed at Highclere Castle, which became a home for evacuated children from the capital. Their son Henry fought in the war but managed to survive, while Catherine’s second husband wasn’t so lucky. Even Catherine and Porchey’s daughter Penelope contributed to the war effort in London. Lady Catherine is not the exuberant personality her mother-in-law Almina was. She’s more passive and prone to bouts of depression that lead her to drinking. This is understandable, considering that her life was mired by tragedy. Yet, Catherine isn’t as weak as she seems. Eventually, she manages to face her problems and come out of them stronger. She found strength and peace in the Catholic religion and spent long periods in a convent. 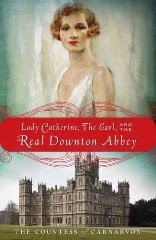 The author also weaves in the narrations the stories of some of the servants and other residents at Highclere Castle. The book is informative, full of historical details and personal tidbits that enhance it rather than bogging it down. It’s entertaining, fun and even gossipy. If you love Downtown Abbey, or simply a good story, you must pick this up. You won’t regret it. In 2012, Richard III’s body was finally found in a Leicester car park. 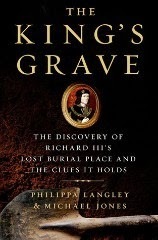 This book chronicles this event from the very beginning when, years earlier, Philippa Langley, a member of the Richard III society, visited the old car park (and experienced the awkward feeling, which was to be proved right, that she was standing right on top of his grave), to the discovery of the body and its later identification. But this only covers half of the book. Langley hoped that finding Richard’s body would also help us discover the real man and the king he was, and squash, once and for all, the Tudor propaganda portraying him as a ruthless hunchback. Langley believes Richard was a good king, concerned with law and justice. Yet, some of his actions, such as the way he seized the throne, remain highly controversial. Therefore, the other half of the book is dedicated to putting Richard back in the context of his own times to try and get a better understanding of what kind of man he was and why he acted the way he did. One issue the two authors can’t agree on, though, is what happened to the Princes in the Tower. Langley believes Richard innocent of the crime, while Jones thinks Richard felt like he had no choice but to get rid of his nephews to secure his throne. Both theories, with their pros and cons, are examined in the appendix, allowing the reader to make up his/her own mind about what really happened to the Princes. The book is full of interesting details, both about the dig and Richard III and his times. Yet, it flows easily and is a pleasure to read. It just never becomes boring. Overall, I think this is a great read for people interested in Richard III and the war of the roses. It offers new insights on Richard III that will make you challenge his popular tyrannical image.